Come into Fate/Extella: The Umbral Star cold, and it’s hard not to feel overwhelmed. Following on from the events that occurred in Fate/Extra on PlayStation Portable, Marvelous takes the stance that those that will pick up this latest Nintendo Switch release will be more than familiar with everything that has happened so far. Servants. Masters. Holy Grail War. Moon Cell Automaton. SE.RA.PH. It isn’t long before Fate/Extella hurls these words in your direction and expects them to resonate, relying on those with lingering memories to piece everything together to make sense of it all. 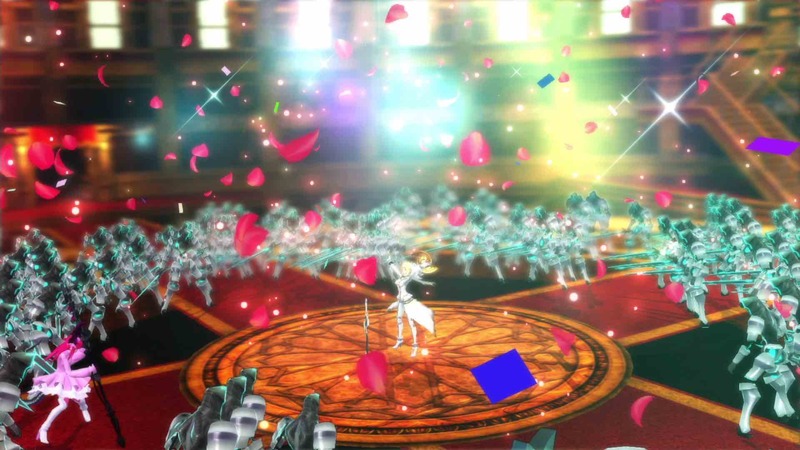 For the rest of us, we’re left lamenting the absence of a recap – especially given the fact that six years have passed since Fate/Extra’s release, let alone that copies are scarce these days. That is not to say that you won’t understand in time. The original tale that series writer Kinoko Nasu has penned casts the player as a Master who can command ancient warriors of legend and imagination. These are known as Servants, who have survived the Holy Grail War that took place on the Moon. Now that the war has ended, they are watched over by an all-powerful lunar super computer – the Moon Cell Automaton – and battle for dominance over a digital realm, called SE.RA.PH. Your customisable character awakens in a throne room suffering from amnesia. 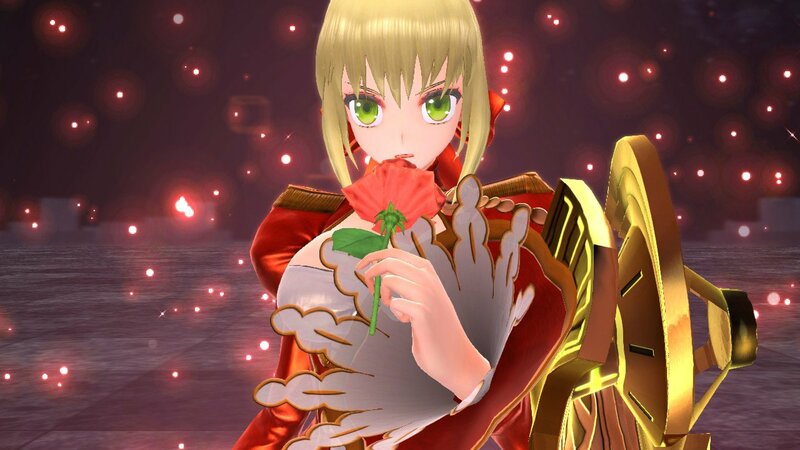 Fate/Extra heroine Nero Claudius explains that you are the Master and that you both won the Holy Grail War, a victory that earned you the Regalia and now sees you looking to maintain peace in SE.RA.PH. But, when another Fate/Extra heroine, Tamamo no Mae, starts to invade sectors in SE.RA.PH., it is discovered that she is in possession of her own Regalia – something that shouldn’t be possible. That largely drives the story, which is riddled with intrigue. If, as a newcomer, you can keep up with that, then you are good to go. Those that let themselves become invested will soon discover an engaging plot, that, after harrowingly opening with a catastrophe that destroys all civilisation on Earth, soon sees players take control of Nero in an introductory combat sequence. Part-action game, part-visual novel, the Main Story mode in Fate/Extella treads three perspectives, presenting the player with the chance to see how different factions wrestle to control SE.RA.PH. The text-heavy approach will often see you reading through reams of dialogue, backed with Japanese voice over. The character interactions have been localised particularly well, and you will grow to like the wider ensemble that plucks characters from Fate/EXTRA, Fate/Stay Night, Fate/Zero, Fate/Apocrypha and Fate/Grand Order. After you complete Nero’s main story, you can then explore that surrounding Tamamo and then Altera’s. It’s worth sticking it out and working through these, Fate/Extella only offering Side Story and Free Battle modes to lend more content to the game. The side stories revolve around the other Servants that make an appearance in the game, and, upon completion, will reward you with new costumes – whether that is a good enough incentive or not is down to you. However, you must first complete the three Main Story campaigns to unlock them all to play. It is in battle, however, that Fate/Extella soon starts to shine. This will see you take on separate stages that can be tackled on Easy, Normal and Hard, with the recommended level for the easier difficulties normally falling around how much experience your character has accumulated. I always hate to make direct comparisons, but the gameplay structure for these will be familiar to anyone that has ever dipped into the Dynasty Warriors series, or even Hyrule Warriors. Placed in a wider battlefield, that will see you be challenged with capturing and maintaining control of sectors, with allied Servants leading the charge against your enemies. In order to successfully clear each stage, you will need to defeat the Boss Servant. That will first require that you gather Regime Keys to take control of the Regime Matrix in order to make them appear on the battlefield, and, if that sounds fanciful, it simply means that you need to take over sectors. Each sector is filled with soldiers that SE.RA.PH designed to combat outside threats, that, thanks to some lacklustre AI, will simply stand around and wait for you to carve a path through them. Killing enough will make enemies called Aggressors appear, which must be defeated in order to seize control of the sector. Sectors are assigned different Regime Ranks, that show how many Regime Keys you will receive once they are under your control. It makes sense to head to those with the most, and that’s clear enough to spot on the minimap. However, if the enemy completes their Regime Matrix first, it will result in mission failure. Enemy Servants will attack your controlled sectors, so it certainly isn’t as simple as it sounds. There are times when Battle Objectives are thrown into the mix, tasking you with neutralising enemies in certain locations, or taking control of specific sectors to dispel adverse enemy effects. This all comes together to make battles feel particularly fast-paced, as you race to keep ahead of the enemy forces. Combat will see you unleash a concoction of Normal, Unique, Heavy, Special Heavy, Dash Heavy and Jump attacks as standard, although there are more potent skills that players can utilise. If you collect three Phantasm Circuits you can reveal the true name of your Noble Phantasm to deal damage to all enemies within a particular sector, while clothing that can be crafted will let you use Code Cast abilities such as letting you heal, distracting enemies with a decoy or switching your character for a secondary Servant. There’s also the Moon Crux, a new battle mechanic that sees your Servant change into a more powerful form that can see them completely devastate nearby foes. Your performance in each stage is scored across your total kill count, max combo, damage taken, and sectors controlled, completion rewarding players with Mystic Code recipes to use in crafting and experience to spur your character’s potency in the midst of combat. Levelling your character up not only lends a boost to their health, attack power and defence but will also let them learn new combos to help you chain merciless attacks against the hordes that you face. 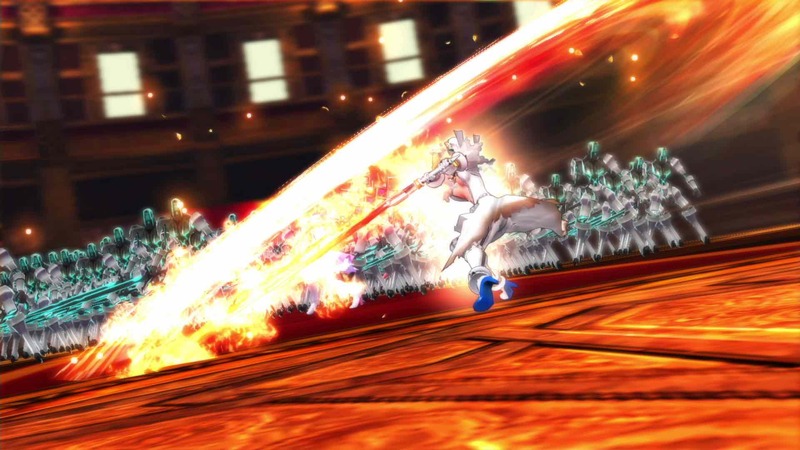 There are also Install Skills that you can equip, adding elemental damage to your attacks among other bonuses. It is the maps themselves that let the experience down, far too similar to one another and having not been built with much imagination in the first place. The only aspect that many will find interesting is the slipstream that your character leaps into to move between sectors, which provides a particular rush away from SE.RA.PH.’s neon aesthetic. Another quick win is that Fate/Extella largely maintains a consistent frame rate despite all the non-stop action on the screen. That’s not to say the graphical fidelity is the best that we have seen, with assets looking blurred and lacking in detail. From what I have heard this appears to be the same on the PlayStation 4 version, but it’s a shame that the presentation isn’t sharper. The Gallery Menu will let you learn more about each Servant, rewatch cutscenes, listen to music, flip through an Encyclopaedia to understand more about Fate/Extella‘s lore, check the Code Cast items that you have crafted, and Install Skills that you have gathered. While the Japanese voice over performances are commendable, the accompanying music meanders without adding any real drive to the experience. The battle tracks do their best to add some punch, but, as a whole, the soundtrack feels generic without any real identity. Fate/Extella: The Umbral Star packs plenty of promise, but falls short in certain areas. Gratifying combat can’t outweigh an experience that is too readily prepared to let players sit and read through great lengths of text. When you eventually get to the action it can be spectacular, there just isn’t enough of it.